Make the dressing while the grill is heating: In a small bowl, whisk together the vinegar, garlic, ginger, soy sauce, sherry, hoisin, mustard and olive oil. Set aside. Brush the onion slices and yellow peppers with vegetable oil and season with salt and pepper. Grill the vegetables slowly over medium heat until soft and slightly charred, about 10 minutes. Take them off the grill and separate the onion slices into rings. Grill the steak until desired doneness, about 6 minutes on each side for medium. Cut the steak against the grain into 1/4-inch slices. 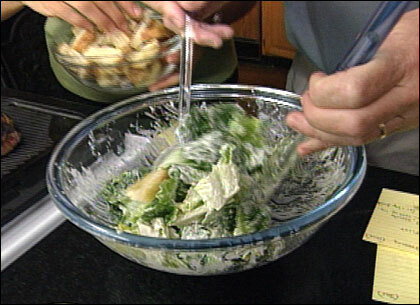 Toss the greens with a very light coating of dressing and arrange on a serving platter or individual plates. Spread the onions and peppers on top of the lettuce and arrange the sliced steak attractively on top, allowing the onions and peppers to show through. Drizzle a little more dressing over the salad and serve warm. Put the lemon juice, Parmesan, garlic, milk, and Worcestershire sauce in a food processor, and pulse until the mixture is fairly smooth. 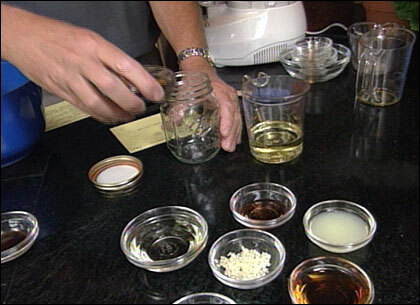 With the machine running, add the oil slowly until the dressing is emulsified. Add the salt, pepper, oregano, and parsley, and pulse twice to blend. In a small bowl, whisk together the soy sauce, rice wine vinegar, red wine vinegar, lemon juice, sesame oil, sugar, salt and garlic. Gradually whisk in the vegetable oil until well blended. Put all the ingredients into a medium bowl and whisk until well blended. Melinda and Robert Blanchard note: Look for anchovy paste in convenient tubes. They keep for months in the refrigerator. In a small bowl, whisk together the mustard, vinegar, lemon juice, salt and pepper. Gradually whisk in the oil until the dressing is emulsified. 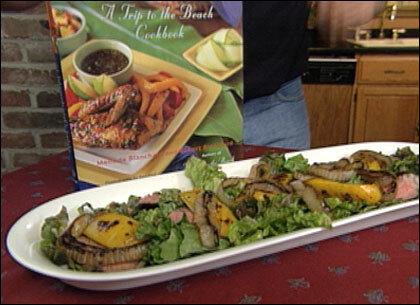 This segment appears in show #2811.